Happy April Fools' Day! This is no joke. It's shorts season in the bay. And the jacket was actually a last-minute call, but I think it works. This is my first time wearing this magenta beauty, but I think it might be just a bit too big on me. If you think you'd like it for yourself, then you might be in luck because I'm thinking about putting it up on Layered Muse for you muses. If you follow me on Instagram, then you know that I spent the weekend with friends in Austin. We went to S. 6th Street, the Alamo theater, Juan In A Million, saw hundreds of bats, came in 3rd place at trivia, saw the James Franco movie Spring Breakers and much more. Keep Austin weird. 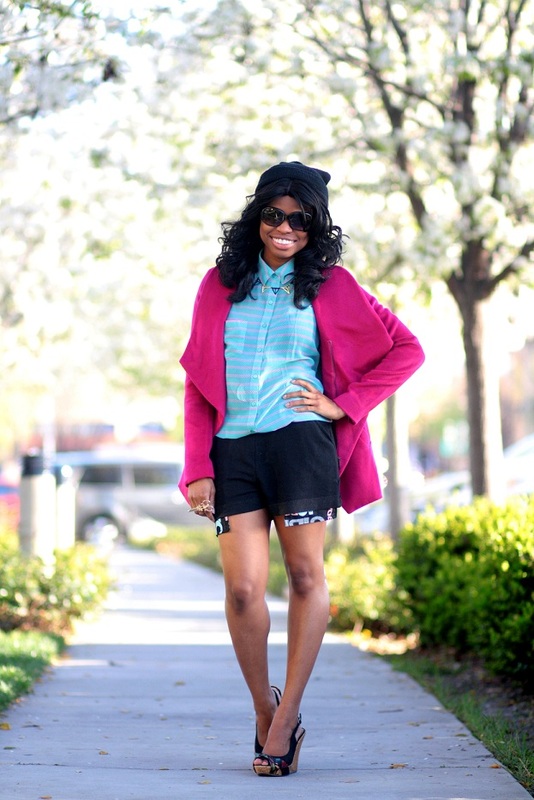 So this look is part of the Blogger Week at Shoplately that lasts from April 1-April 4. I'm featured highlighting my favorite accessories by XVII. | Forever 21 open back top | Boy Meets Girl coup d'oeil shorts | Charlotte Russe twisted floral wedges (similar) | XVII chop chop ring c/o Shoplately | XVII cross my heart bracelet c/o Shoplately | Nastygal Dakota drape jacket | XVII swallows ear cuff c/o Shoplately | XVII hollow pyramids necklace c/o Shoplately | Michael Kors sunglasses | By the way, thanks for all the feedback from my last blog post on blogger insight. I'll get to your blogs shortly (I just had to catch up on The Walking Dead finale and the Game of Thrones premier first). this look is just perfect....loved the necklace, shorts and shirt tooo much !!! ooo pink! i LOVE that jacket! so bright and bold. an amazing color on you! Cute outfit and you look stunning as always! Love the magenta jacket - such a great color on you! what cool shorts! sorry the jacket didn't fit but the color is lovely! That jacket is pretty rad, too bad that if it is big on you it would probably be big on me too.... Love you scissor ring! Very cute look - Love that top, the open back is just gorg. Happy Easter! I'm jealous of your weather! I love that top! I love your shorts, your scissors ring is a Wowcha! lurv it,would love to go on commenting on every details on your outfit but at this point would say perfect!!! hi sweetie..same here born in Kingston but I actually grew up there, ive been here on and off for 4 yrs until I finished university.. This look is so gorgeous, and I may need to check out that gorgeous jacket! Hope you had fun in Austin! The short is amazing and I am loving the pink jacket!!! Ohhhhhhh Cheryl l lovvvvvvve this look. You are just gorgeous from head to toe!! I had no clue you watched Game of Thrones we are going to have to so talk about it now. Last night I wasn't impressed. I was looking for a bit more but this season looks promising so I am still excited. Blue and pink are gorgeous on you girl and I love the shorts! this is one of my fav looks on u... u look very california girl! you have such a wonderful blog. Firstly, i love the quality of photos, and second, you have an amazing style! I love the combination of colors you did with this outfit. the pink definitely stands out. speaking of walking dead and game of thrones, i'm so left out. need to catch up too! I love the cut-out on the back of your shirt and the side-ways cross bracelet. I've been wanting either a bracelet or necklace like that. It's cute and different! Anywho, I love the black beanie and how the pieces all go together based on the color scheme. Love it! Love the details of your shirt! And lucky you to break out your shorts;-) Its still chilly here for summer legs:-( You look gorgeous and the color combination in this outfit is so pretty! Hope you are having a wonderful day! Thank you for sharing at the hop, your participation makes the hop extra special. Big Hugs P.S. the new giveaway posted yesterday! Love that fabulous pink jacket!